Up until this point my daughter has not tracked her spending habits. She has saved a good deal of money for a 16-year old and she knows how that money will be used. But as for spending, she hasn’t kept track of where that money goes. She just spends it however she wants, which is typical of what most teens do. A checking account will force her into budgeting every month. She will have to account for how much money to give each month, how much to spend on clothes, how much can be used for activities with friends, etc. I am more than glad to show her how to make a budget and keep track of every dollar she uses. Budgeting is important because funds in a checking account are limited. You can use the debit card linked to your checking account to make purchases. However, you cannot spend more than you have in your account without being assessed overdraft fees. Debit cards act the same as cash. Once you make a purchase the funds are withdrawn from your account. This forces you to slow down your spending and routinely monitor how much money you have left. For a teen, this is a great lesson to learn. This reason is more for the parents than the teens. Let me explain. My daughter is 16, having just started her junior year in high school. I’m realizing that time is short. I have less than 2 years before she goes off to college. At that time my oversight and control of her life will plummet. Parents manage a child’s life from the time they are born. They need guidance, protection, limits and instruction. Without us they would likely not survive childhood. But at some point we have to let them go. We don’t have to like it – and I don’t – but that is the design of things. They grow into adults capable of making their own decisions. Independence starts during the teen years. Parents can feel it in many ways. And one of those ways happens to be with their money. Teens use their money in ways and for things that adults may not. Parents can help their teens make wise decisions with their money. However, ultimately it’s their choice – just like it will be their choice in adulthood. A checking account is a big step forward in a teen’s financial life. It helps promote this drive towards independence they are feeling. In essence, they are in the big leagues now – debit card in hand – doing what grown up people do. Remember the first time you tried to ride a bike? Or jump off a diving board? Or do a home improvement project? It was a little nerve-racking, wasn’t it? The first time for everything is a little shaky. You don’t quite know how to handle the situation or know what to expect. However, that doesn’t last for long. The more you rode that bike, the more confident you became. Handling money is no different. The more teens are engaged in financial matters, the more experience and confidence they will gain. They will learn how to handle the mundane, day-to-day stuff as well as the complex situations that arise. And parents, they can do all this under your watchful eye. Financial matters aren’t always a breeze. There will be some adversity along the way. You can help your teen manage that as well. Overcoming financial adversity will breed confidence that they can tackle anything life throws their way. 2. Make sure you, as the parent, have access to monitor all accounts. You don’t want your teen transferring large amounts of money from savings for things they don’t need. Keep an eye on what they are doing especially in the early going. 3. Watch and help them with their first transactions. Sit down with your teen if they make an online purchase or go with them to the store on their first shopping trip. Help them navigate pushing the right buttons at checkout and filling in the right fields online as they make their first purchases. 4. Talk to them about debit card safety. Make them aware of how thieves can steal their bank information. They need to know how to use their card safely. 5. Turn overdraft protection off. Most banks have this service that denies a purchase to go through if there is insufficient money in the account. This keeps the account holder from spending more than their balance and owing overdraft fees. 6. 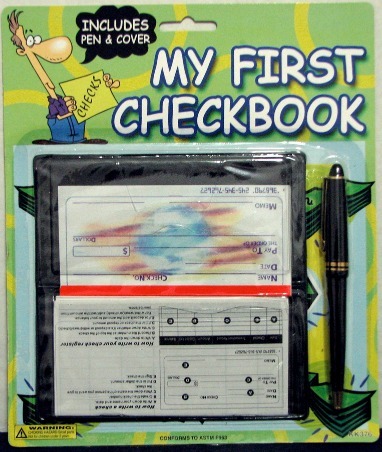 Teach them how to balance their checkbook. Most financial software will do this for them. However, they need to know how to do this manually should the need arise. Your child will need a checking account at some point in their lives. Best to help them set one up in their teen years when they are ready. That way, they can receive help in managing it and avoid getting into bad habits along the way. Questions for Discussion: Do you think teens need a checking account? When did you get your first one? What checking account mistakes have you made along the way? Start them young. Financial responsibility should not just be considered “adulting”. Kids these days deserve to know the benefits of being responsible with money at an early age.